The next meeting of CVO will be held at the Jesse Brown VA Medical Center in the 2nd floor Conference Room on this Wednesday, March 21st at 7 PM. The Executive Committee will meet before hand at 6 PM. All are invited. Executive Committee members are encouraged to be on time. CORRECTION: There will not be an Executive Committee meeting on March 21, 2018 CVO meeting. LaShun James will make a presentation on Addus Homecare for Veterans. This is an important medical issue for Veterans, so be sure to come and hear LaShun. Also, nominations will be held for the Executive Committee. All nominations must be made at this meeting. The elections to the CVO Executive Committee will be held at the April meeting. Very Short Notice: CVO Action: Stop Cutting the Budget on the Backs of Veterans! 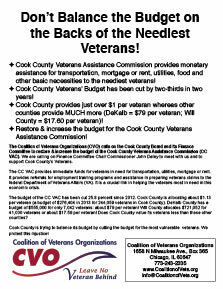 CVO is conducting an action to support the Cook County Veterans Assistance Commission (CC VAC). We will meet at 10 AM on Monday, October 21st on the 5th Floor of the County Building, 118 N. Clark Street. We will try to meet with the Finance Committee Chair, John Daley in Room 567 and have them increase the budget of the CC VAC instead of cutting the budget on the backs of veterans! The CC VAC provides immediate funds for veterans in need for transportation, utilities, rent and other assistance. It is a crucial link in helping the veterans most in economic crisis. The budget of the CC VAC has been cut 25.8 percent since 2012. Cook County is allocating about $1.13 per veteran (a budget of $276,404 in 2013 for 244,059 veterans in Cook County). DeKalb County has a budget of $555,000 for only 7,042 veterans: about $79 per veteran! Will County allocates $721,052 for 41,000 veterans or about $17.59 per veteran! Does Cook County value its veterans less than these other counties! Cook county is trying to balance its budget by cutting the budget for the most vulnerable veterans. We need to protest this injustice and to have the Finance committee recommend an increase in the budget for the Cook County Veterans Assistance Commission. Come out and make this action a show of veterans solidarity. We need to build unity and fight this injustice!